You can clean clogged drains with your pressure washer using an attachment called a sewer jetter. A sewer jetter is a long, flexible, high-pressure hose with a jet nozzle on one end. The nozzle typically has a front-firing jet to break apart clogs, and back-firing jets that propel the jetter hose forward into dirty drains and scrub the sides of the pipes. The other end of the sewer jetter has a coupling that attaches to the spray wand or trigger gun of your pressure washer. A sewer jetter nozzle’s back-firing jets pull the hose deep into drain lines so there’s less physical effort required. A sewer jetter can thoroughly scrub the sides of a dirty sewer pipe as it travels through the line. This can reduce your need to clean the drain as frequently. A sewer jetter can efficiently flush out remaining clog residue after it breaks apart a clog. 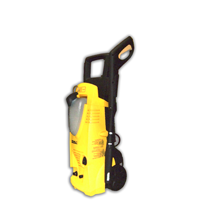 Because it has no moving mechanical parts, a sewer jetter attachment is easier to clean and store after the job. For more details see our article about the differences between a mechanical drain cleaner and a sewer jetter attachment. The key to efficient drain cleaning is to use a sewer jetter attachment with the right combination of nozzle orifice size and configuration, hose diameter, and fittings to match your particular pressure washer, as described in the following sections. Electric pressure washer flow rates of 2 GPM and below can actually work to your advantage. That’s because these flows work well with smaller diameter jetting hoses that are easier to handle and flexible enough to slide through many drain elbows and larger P-traps. This makes an electric pressure washer a good choice for working upstream of the clog at an indoor cleanout, as discussed in our article about sewer jetting indoors. 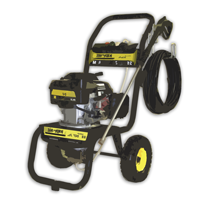 With the right choice of jetter components an electric pressure washer is suitable for cleaning residential drain pipes up to 4″ in diameter. a jetter hose with the smallest possible diameter that can work without overloading your machine. a jet nozzle with orifices that closely match your electric pressure washer’s PSI and GPM rating after accounting for pressure buildup in the sewer jetter line, and a discharge pattern that maximizes pulling power for the smaller GPM flows of your electric pressure washer. a coupling end with an adapter that fits your trigger gun so you can use the trigger as the on-off valve and avoid the cost of buying an additional control valve and fittings. Electric pressure washer trigger guns have special styles of connections, so be sure to choose an adapter that fits your model. There’s one style of adapter that fits most Kärcher electric wands, and a different, “universal” style with an O-ring that fits most other brands. The flow rate of a residential gas pressure washer is typically between 2 and 2.9 GPM. This gives you an ideal balance of jetting power and ease of use for cleaning household drains up to 4″ in diameter. a jetter hose with the smallest possible diameter that can handle the intermediate GPM flow rate without overloading your machine. a jet nozzle that’s closely matched to the GPM flow of your machine, with a spray pattern that’s optimized for more thorough cleaning. a coupling end with an adapter that attaches directly to the spray wand or trigger gun of your gas pressure washer so that you can use the trigger as your on-off valve and avoid the cost of an additional valve and fittings. With typical GPM flow ratings between 3.0 and 4.0 GPM, commercial gas pressure washers can give you strong pulling power for deep penetration into long sewer drains and the flexibility to clean drain pipes of up to 6″ in diameter. a jetter hose with a diameter that’s large enough to handle higher flows without overloading your machine. a jet nozzle with larger orifice openings suited for cleaning a wider range of pipe diameters under higher flow conditions. a coupling end with an adapter that matches your pressure washer trigger gun. 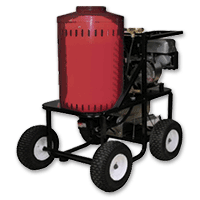 Hot water pressure washers have heaters that bring water to near boiling temperatures. Because very hot water can clean dirty surfaces much faster, hot water pressure washers almost always rely on pumps with far lower PSI pressure ratings than cold-water machines with equivalent GPM flows. since water over 120 degrees F will cause conventional sewer jetter hoses to quickly fail, when using heated water it’s important to choose a jetter hose that’s specially designed for high temperatures, and also has a large enough diameter to avoid overloading hot-water machines. a jet nozzle with orifice sized to handle the lower PSI pressure ratings of nearly all hot-water pressure washers. a coupling end with an adapter that matches the trigger gun connections that are unique to hot-water machines. 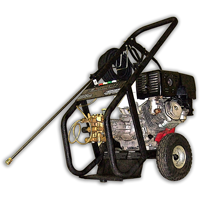 You can buy a sewer jetter for your hot water pressure washer with a specially designed hot-water hose and nozzle. The cost to build a reliable 100-foot sewer jetter from quality-made, US or German components starts at less than $150. For information about selecting the right parts, see our articles about choosing the right sewer jetter hose and choosing the right sewer jetter nozzle. Or, you can buy a ready-to-use sewer jetter, made from quality US components, that’s custom matched for your type of pressure washer. Next: how to unclog a main sewer drain with your pressure washer.